When the Louisville hackerspace LVL1 was discussing the purchase of a new laser cutter, a member said, “I could build one before you get around to buying one.” The gauntlet was thrown down, a challenge was set, and the race was on to build a tiny laser cutter before the hackerspace took delivery of their new laser cutter. The mechanical aspect of the build is fairly simple. 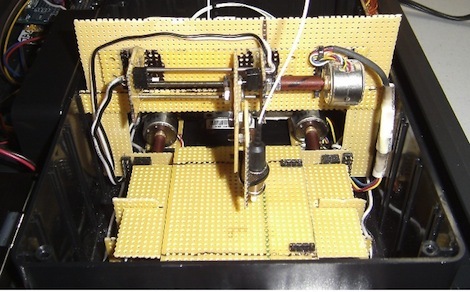 The X axis is simply a stepper motor, threaded rod and laser module mounted on a carriage. This carriage moves along the Y axis with the help of two stepper motors for either side. Everything was mounted on more perfboard than reason would suggest. For the electronics of the project, three motor drivers were made with a few logic chips and the laser firing relay was stolen from test equipment developed for LVL1’s trans-Atlantic balloon build. Motor and laser control was handled by an Arduino to keep the build simple because the contest was over after the first laser was finished cutting a square. LVL1 is now working on a second version of the winner of the laser cutter challenge. They’re planning on a touchscreen interface that will cut a plastic blank about the size of a credit card. We can’t wait to see the results of that build. ← ATtiny Hacks: Look Ma, no batteries! you missed the href on the “tiny laser cutter” link. Any pics of something actually cut with that machine? I want to know more about that laser. Me too, there is no info about the laser used. The laser is a 750mW communication laser on a fiber, 830nm. They appear on eBay for less than $50. The laser was selected since it is easier to move the fiber optic coupling around then the entire laser and wires. The laser is the tiny silver rectangle in the photos behind the perf construction. I’m a member of LVL1. I’ll try to get JAC to post more details this evening. The laser used is a low(ish) power red laser pumped through an optic fiber. I believe it’s similar to the laser used in CD burners, but run at a slightly higher current. It’s nothing special, really. It takes 6-10 passes to cut through card stock, and manages to do so surprisingly cleanly. The biggest issues are axis wobble, as you might expect from something build out of perfboard and hot glue. neat! i really like the look of the perfboard design. I’ve just started looking for a way to inexpensively customize stacks of existing business cards…and this might just do the trick. Thanks for sharing! I love DIY builds. But how much functionality / accuracy / safety are you sacrificing here? Threaded rod vs ACME threads or ball screws…. no contest. How much utility does this thing truly have? Seems a bit low powered but cheap and fast to go together. The Micro-Laser Cutter is a proof of concept. The web page mentions the next version which is intended to take it from a gimmick to a practical project. When the next version is ready, I’ll submit a notice. This is the map of the journey, the actual paths will be a worthy adventure. @JAC_101: I am interested on using such kind of laser. Can you please tell me what are the safety measures you/we need to take? I found that fiber coupled laser diode on Ebay. I would like to know what are the size of the smaller dot/lines produced by that laser.